I finished the 100 day challenge in the middle of October, the day before we left for a visit to our friends in Denmark. I’m so sorry not to have got round to writing this up sooner. To recap, this was a challenge I set myself as part of my (self-designed) programme to improve the condition of my leg affected by lymphoedema. The background is that my leg became much worse in February when Malcolm and I were away on holiday and walking around (just exploring a city new to us) a lot every day. My leg swelled, became red and uncomfortable, and nothing I did seemed to help. The stocking I had been prescribed seemed not to help at all, in fact if anything it was making my upper leg worse. This deterioration sparked my return to my GP when I got home. I needed a course of antibiotics to deal with an infection in the leg, and the deterioration left me feeling quite despondent about my future health. This though turned out to be A Good Thing, because it forced me to question the treatment I had received and to read up for myself about lymphoedema – something that until then I had neglected to do. What I learnt shocked and worried me – the ‘treatment’ prescribed thus far was inappropriate, ineffective, and not recommended; further ‘treatment’ with a prescription of diuretics could have been positively harmful had I followed it. The upshot of all of this was that, supported by everything I read on the excellent website provided by the Lymphoedema Support Network and other information I found on the internet, I was able to return to my GP and ask for a referral to the specialist community clinic in our area. And thank goodness for this – the GP was very helpful and receptive, and once I had the clinic appointment I received excellent advice and treatment from a wonderful, knowledgeable and experienced specialist nurse, who measured and fitted me with a made-to-measure full leg pressure garment. I also found someone local qualified to provide a specialist form of massage (Manual Lymphatic Drainage). And I have learnt the importance of regular exercise, in combination with wearing the correct pressure garment. So – the challenge was to make sure that exercise is an integral part of my everyday life. I decided on at least 1 hour a day of something reasonably demanding. Things I have read encouraged me to think that if I could follow this regime for 100 days, it would become a normal habitual part of my life, and something I would just do without thinking too hard about it. I chose a range of exercise: walking, running, swimming and cycling. I set up an off-peak membership of our local (municipal) swimming pool, which brought with it the benefit of gym membership. Each visit to the swimming pool/gym entails a 50 minute round walk, so before I’ve even set foot in the pool I’ve already done most of my hour. I can do more than I imagine I can – I swam a mile for the first time in my life. Yay me! 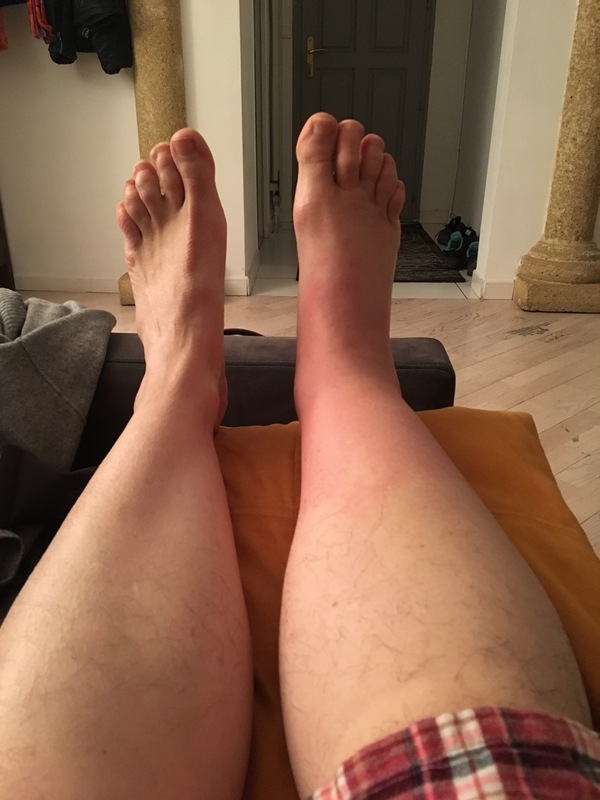 The pressure stocking has had a fantastic effect – my affected leg started at 60% larger than the unaffected one. In just 6 months the swelling has reduced to 42%. As the swelling has reduced, I’ve been prescribed smaller stockings. I’m on to my 4th different prescription now. Best of all, instead of walking making it worse, it now seems positively beneficial. Exercise is a crucial part of the healing/maintenance regime. I try to treat it as I would a prescription of some kind of magic medicine – that is, I make sure I don’t miss. I’m convinced that setting myself this challenge has been a really effective way of getting into the way of it. It’s definitely an approach I will use in future, if the need arises. This entry was posted in 100 day challenge, Do what you can with what you have, Reflections on life (and death), Uncategorized and tagged 100 day challenge, Coping, Exercise, Lymphoedema, Lymphoedema Support Network, Public services, Swimming, Walking. Bookmark the permalink. Thank you so much! and yes, exercising an element of control is very important to me. I’ve got a crucial hospital appointment this week, and am really hoping that this will prove to be useful. That was nearly my story! I also exercise 1 hour every day now after I signed up to a challenge in a lymphedema fitness group on Facebook in Dec 2017. It changed my life to prioritise exercise with ADEQUATE compression. I am in the best shape of my life. My leg is thanking me every day. You should consider getting a rebounder. Works also really well. This is both scary (because what if you hadn’t figured things out on your own?) and inspiring. I’m glad you’re on the mend. If you don’t mind my asking, is the prognosis that you will be able to reduce the swelling down to zero? ‘What if’ indeed! Which is why I’m such a fan of educating ourselves on our own medical conditions (and those who are dear to us). I’m very much on the mend, I’m pleased to say, but the prognosis is that I will always live with this condition (ie its life-long), and it won’t reduce to zero. The key though is good self-care, and ensuring that I get and keep all my appointments to ensure that my pressure garment is always kept at the right size and grade. Wow! I’m so impressed with your research and your new exercise lifestyle. Congrats! Thank you so much! You may be interested to know that my public library was a great help too. To my surprise they stocked a really useful book I wanted to read, but didn’t really want to have to buy (and I was right, it was a useful read but not a keeper). It sounds like the treatment you prescribed yourself is really working! It must be great to feel better after being in such discomfort. And again, simple ‘do it yourself ‘ remedies like exercise have done the trick! Yes, very much so. Of course I’m fortunate that that’s what the condition really needs. Also that I have access to a wonderful very experienced specialist nurse who fits me with the pressure stocking. With the stocking, exercise is really really beneficial. Without it, exercise is positively harmful. Sadly this kind of expertise is being whittled away in the NHS – I know that in some other areas people in my condition don’t have access to any specialist treatment and I assume either pay for it or simply get worse and worse (of course, at even greater expense to the public purse).